Damaraland — which gets its name from the Damara people who where relocated here during Namibia's Apartheid era in the 1960s-70s— extends from the main road to the north of Swakopmund for 600 kilometers up to Kaokoland in the north, stretching 200 kilometers inland from the windswept beaches of the Skeleton Coast. The region consists of a variety of habitats, from wide open grassy plains, giant granite rock formations and deep gorges cut by centuries old water courses, to the dramatically different desolate desert landscapes and sandy beaches in the western part of the region. 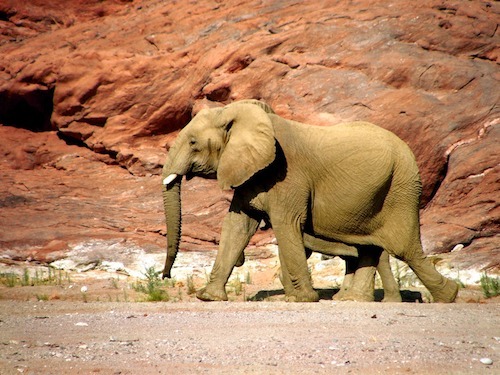 Yet, even these barren sandy wastelands support a diverse range of wildlife that have adapted to living in the harsh desert conditions, including black rhino, desert elephant, giraffe, springbok and ostrich. Rock Art — The area has a rich cultural history with plenty of rock art on view at Twyfelfontein, Spitzkoppe and Brandberg. Twyfelfontein is home to the most extensive gallery of Bushman rock paintings in Africa (and by extension the world), while the famous 'White Lady' Bushman painting can be viewed at Brandberg. Mountain Climbing — Brandberg, the highest mountain in Namibia, and Spitzkoppe, also known as The Matterhorn of Africa, attract mountain climbers from all over the world, offering something for casual hikers and more experienced mountaineers alike. Geological Attractions — there are plenty of unique geological features of special interest to see while visiting Damaraland, including the Petrified Forest, remnants of trees that were uprooted millions of years ago and preserved by sediments that have since been eroded away to expose the petrified wooden stumps. Other attractions include The Vingerklip (which means finger rock), a pillar of limestone that towers 35 meters high; the Burnt Mountain, a flat-topped mountain surrounded by black pieces of limestone; and the Organ Pipes, which are located in a gorge to the left of the road leading to Burnt Mountain. Game Tracking — Those wishing to actively take part in wildlife conservation initiatives, can take part in a guided Rhino and Elephant tracking safari, which is not only great fun, it helps generate funds for the conservation of these endangered species. 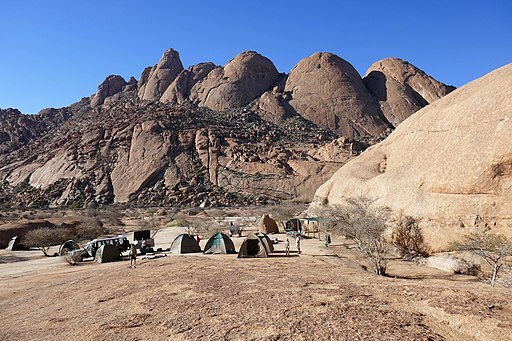 Damaraland has a wide range of accommodations on offer including camp sites and luxurious lodges catering for all types of budgets located near all the main attractions. For those wanting to take a walk on the wild side, a trip to Damaraland is highly recommended.